Assassination attempt (October 14, 1912) – John Schrank shot him, but the bullet lodged in his chest only after penetrating his steel eyeglass case and passing through a thick (50 pages) single-folded copy of the speech he was carrying in his jacket. Roosevelt, as an experienced hunter and anatomist, correctly concluded that since he was not coughing blood, the bullet had not completely penetrated the chest wall to his lung, and so declined suggestions he go to the hospital immediately. Instead, he delivered his scheduled speech with blood seeping into his shirt. He spoke for 90 minutes. 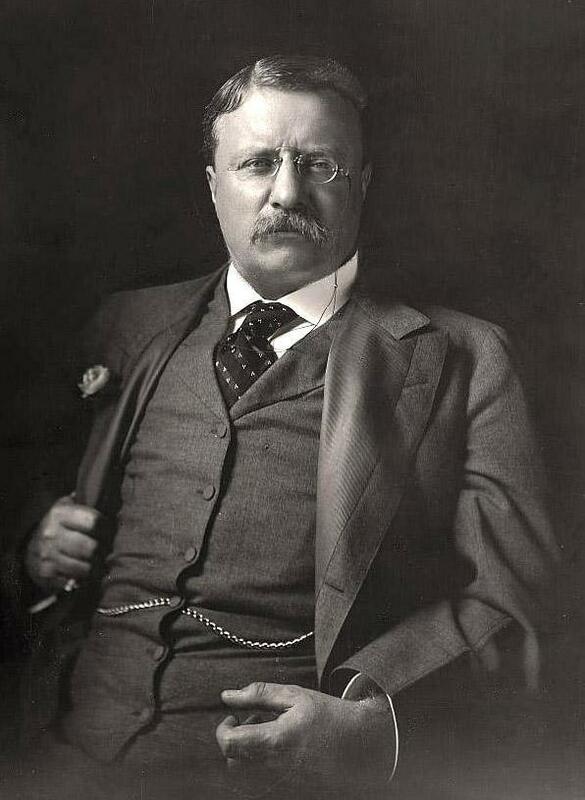 His opening comments to the gathered crowd were, “Ladies and gentlemen, I don’t know whether you fully understand that I have just been shot; but it takes more than that to kill a Bull Moose.” Afterwards, probes and x-ray showed that the bullet had traversed three inches (76 mm) of tissue and lodged in Roosevelt’s chest muscle. Safari (1909) – Upon leaving the presidency, Roosevelt went on a Safari. Roosevelt and his companions killed or trapped more than 11,397 animals. Of these, their kills included 512 big game animals, including six rare white rhinos. The expedition consumed 262 of the animals. Tons of salted animals and their skins were shipped to Washington; the quantity was so large that it took years to mount them all, and the Smithsonian shared many duplicate animals with other museums. Amateur boxer (1876-1880) – While attending Harvard University, Roosevelt was also a well known amateur boxer. New York City Police Commissioner (1895-1897) -Roosevelt implemented regular inspections of firearms and annual physical exams, appointed 1,600 recruits based on their physical and mental qualifications and not on political affiliation, established meritorious service medals, and closed corrupt police hostelries. Roosevelt made a habit of walking officers’ beats late at night and early in the morning to make sure they were on duty. President of the United States of America (1901-1909) – Held record for most hands shook in a day until 2004 with 8,513. Regularly boxed as Governor of New York and as President, until his sparing partner detached his left retina, blinding him in that eye. Occationally skinny dipped in the Potomac River.